Author(s): Moni U. Khobragade, Anjali Pal. Department of Civil Engineering, Indian Institute of Technology, Kharagpur, India. Background: Ni(II) removal from water environment is very important because it is very toxic. There are many conventional methods for Ni(II) removal but many of them have high operational and maintenance cost. Adsorption is a treatment process which is highly effective, cheap and easy to adopt. Objective: The goal of this work is to develop a suitable adsorbent for Ni(II) removal and determine the optimal condition that can be used to get the best efficiency. Results: The surface of alumina is modified with an anionic surfactant sodium dodecyl sulfate to get a bilayer structure, which is suitable to adsorb Ni(II) efficiently. Both batch and fixed-bed column studies were performed with surfactantmodified alumina to remove Ni(II) from water. The adsorption follows Freundlich isotherm and pseudo-second order kinetic model. The thermodynamic parameters indicated that adsorption is spontaneous, endothermic and favorable. About 92% removal efficiency, for an initial concentration of 10 mg/L Ni(II), was achieved under optimum conditions. Maximum desorption (~92%) of Ni(II) from the exhausted adsorbent is achieved with 0.2M disodium ethylenediaminetetraacetic acid. Recovery/extraction of Ni(II) using monoesters of phosphonic acid and 2-hydroxyiminoacetic acid has been patented. In some patents removal of metals has been achieved using ion-exchange resins having bis-(2-picolyl) amine or iminodiacetic acid functionality. 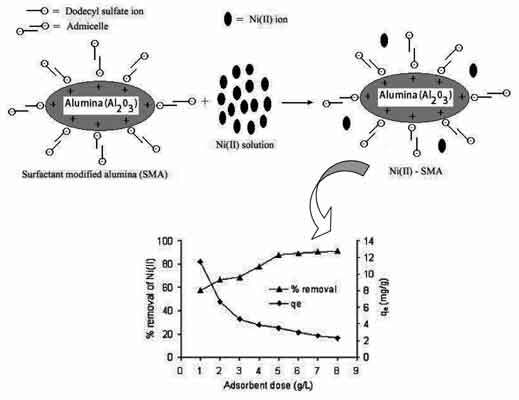 Conclusion: It is found that surfactant-modified alumina, prepared by treating alumina with sodium dodecyl sulfate, is an efficient adsorbent for Ni(II) removal from water and wastewater. The material is cheap, easy to prepare and can be recycled after exhaustion. Keywords: Batch adsorption, column study, isotherm, kinetic study, Ni(II) removal, surfactant-modified alumina. Affiliation:Department of Civil Engineering, Indian Institute of Technology, Kharagpur, India. Keywords:Batch adsorption, column study, isotherm, kinetic study, Ni(II) removal, surfactant-modified alumina. Abstract:Background: Ni(II) removal from water environment is very important because it is very toxic. There are many conventional methods for Ni(II) removal but many of them have high operational and maintenance cost. Adsorption is a treatment process which is highly effective, cheap and easy to adopt.